Those sabers are absolutely gorgeous! No Intellect weapons or shields listed. I hope something appropriate drops in the world. I'd hate to think that my Paladin has been forgotten. I must say, i am impressed by every new thing they add to game. It's like they finaly started to listen to the people. focus on epics from raids is prio, assume, or... solo playing. but wow was never about going on solo, so... assume, garnisons brings epics for heroics and pre-raids and then, with upgrades... lfr...then raids... then heroic raids,,, mythic raids.... yea, raids still stays priority. rp brings more sense now than pvp or pve! Just to put my mind to rest, this "Profession perks are removed" means that blacksmiths won't get the extra sockets, right? The weapons say they are unique-equipped. This is going to be a problem for dual-wielders. Really? Not even a polearm for 2h mace for Ferals/Guardians? I was thinking of rolling bs for my Guardian tank but I'm not too sure about it now. My premade level 100 blacksmith on the Beta cant find an anvil that works. I submitted a bug report. Any suggestions on how to correct this issue? Could someone on the beta tell me how many materials requires a work order in the forge? andwhat does i gives? thanks, and sorry for bad english. Since I don't have beta access... I am very curious about something in regards to all these garrison buildings. Since I'm primarily a blacksmith, I thought I'd ask here. I can't seem to find anywhere listed any actual pros/cons to taking say the Forge if your character already has blacksmithing. I know it says an NPC can sell you new recipes, but I assume it's not going to be the only way to get said recipes... Otherwise it is kind of misleading allowing 'choice' if there is actually no choice and you have to take that building in order to get the warlords recipes. And again, if you were forced to take profession buildings that can produce items, why would you not just opt for dual gathering professions on your character? Simply put... There doesn't seem to be much information, if any, about advantages/disadvantages on taking any of these buildings if you already have the profession. Thus far it largely boils down to "Sells recipes if you have it..." or "Produces a certain item if for use in crafting." and I find it incredibly hard to believe that's all there is to it. I assume there will be things that only pure blacksmiths (ie- those with blacksmithing on their actual characters) can make, like higher tier epics and such... That'd make sense, since you're specifically skilling for it. But so far, I can't find anything of the sort stating as such. Because again, if it boils down to garrison profession buildings being able to craft everything of that profession in the expansion... There'd be little reason for people to not be dual gathering professions on every character they have, and that seems highly ridiculous. 1 ship order requires 25 "Pierre draeniqueDraenic Stone"
1 ship order gives around 12 "Minerai rochenoireBlackrock ore" 25 "Minerai de vériferTrue Iron Ore"
3 ship orders gives around 40 "Minerai rochenoireBlackrock Ore", 80 "Minerai de vériferTrue Iron Ore"
Am I the only one who finds it pure crap that they have that 3 draenor crafted restriction on there? Why cant I forge a full set of that sick Truesteel gear? 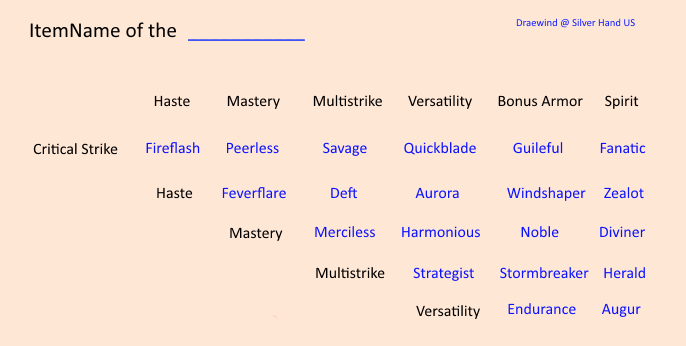 If you read the text for Essence de forgeacier supérieure instable then i think it is safe to say that shields will be added, so the other stuff is probably just not added yet either. Will they ever introduce BC blacksmithing with upgradable weapons again? So, ive been looking arround and apparently there is no way to raise the mining skill over 600 in beta, and the only way to get the ores is by using the trading post. Leveled Forge from 0 to 600 using Bottines sans semelle by slaughtering Porte-pique sire-tonnerre in Daggermaw Ravine in Crête de Givrefeu. Their drop rate is low, but the high concentration and high spawn rate made this a 4 hour exercise at level 100. Tanks, fear not. These can be upgraded to hardened, and then peerless. So did they scrap the peerless and hardened in favor of the Essence de véracier supérieure instable system? I just checked Engineering and the weapon crafted for them is not Warlords-Crafted (3) limit. However, Blacksmithing and Inscription weapons are limited by the new system. Can someone clarify what is going on here? Now if weapons are not going to fall in this system, that'd be great. Dual wielders won't have a disadvantage compared to 2H users. Armor (Main and Sub) would make sense. Is it just me, or do the preview weapon images show not only a stat upgrade but also an visual upgrade for crafted weapons from 630-645-655? No two-handed weapons to craft? I am really happy with the new changes in the Blacksmith profession. Some of the weapons are gorgeous and i am looking forward equipping them. So far seems that they made good additions in the profession and hopefully they will increase the life span of the profession. Be Careful guys, it seems like you can only wear 3 of those items at a time, so choose wisely. I'm a blacksmith but didn't build the Forge. Can I only turn in the Secrets of Draenor Blacksmithing books in Ashran? Question if anyone has gotten there yet... If I craft one of the weapons, reroll it several times until I get what I want and enchant it will I get a random set of stats when I upgrade it or does it retain it's suffix? How do the reshapers work? Do you need the item to be bound, not bound or can it work on just everything as long as it is a weapon/armor? Like can you RR a piece of armor before selling it, or maybe RR it when you get it as BoE? people saying there is a limit to the number of blacksmithing pieces that can be equipped and/or made. Is this from Beta testing or is that current? I have not been able to find any information saying that there is a limit to the numbers I can create or equip. Sorry Im a Noob. Can you upgrade the weapon / armor through multiple characters? Aka send back and forth the BoE item while upgrading? Or is the upgrade a BoE token ? So I crafted the dagger at the Forge with my non-BS rogue. How do I take it from Stage 1 of 3 to stages 2 and 3? Or is that a BS-only thing? The documentation is clear as mud on this. Anyone else, that has the same problem? If I upgrade soulbound gear with essence, will it remain soulbound? I'm pretty sure it will, just want to be sure. At max skill, this is replaced with Truesteel Ingot, which lets you create 10 Truesteel Ingot and has the convenient catch-up mechanism allowing you to skip several days and do several transmutes on the same day. Can someone verify if this is in the game or not? I maxed out blacksmithing the other day, and my truesteel ingot combine hasn't changed, and is still only one cooldown per day that I can see. Still shows a daily cooldown, and doesn't have "charges" like the tooltip above has at max level. I'd hate to skip a day and the 10 ingots production that goes with it just to see if I have 2 combines the next day. Am the only one who is BS over this limit of 3 WoD crafted items? I'll never understand why they would make it that way. With the amount of reagents needed for most of it and the s-l-o-w process of getting said reagents we should be able to equip as many of the damn things as we can make/buy. the npc preview shows shoulders belt and boots equipped for the smoldering gear set but if you look in game via blacksmith gear that one can make the belt shoulders and boots dont even exist. how does one go about obtaining them if they want that version of the truesteel for xmog? any hope of skeleton keys coming? Anyone know if you can craft Mail Gear? I have a Shaman with the BS profession skill but it seems as though I won't be able to utilize his profession because all the items are plate. Does anyone know if crafting mail gear is possible in WoD? If you are a Blacksmith, do not buy the plans to build the Forge at your garrison! Nor the Draenor Blacksmithing Recipe! Just run some dungeons or kill a few mobs at Draenor and soon you will loot the item that starts the Blacksmithing quest. At the end of chain quest you will receive both for free! Does anyone know if there are plans for a true iron skeleton key? Is there no difference in look from stage 3-6 onwards? I feel like they should give Blacksmiths a mount. Like an armored Horse or something. Something armored only Blacksmiths can have.